Marsha Friedman, CEO of EMSI (public relations) was kind enough to provide a nice testimonial of my book, “TurnKey Publishing”. I greatly appreciate her kind words and her support. 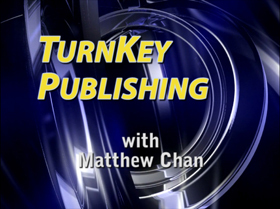 Matthew Chan’s choice of title, TurnKey Publishing, is perfect in describing the contents of his book – a wealth of information – truly a basic primer on the subject. He has included every facet of self publishing anyone would need to know in order to have a thorough grasp of the subject. The book comprises such aspects as: what to write about, budgeting and setting aside of funds toward eventual expenditures, costing, forming your own publishing company, design ideas for the book cover, use of photos, printing options, getting an ISBN number, etc. Matthew covers it all. Not only does he explain the topics in simple understandable terms, but he tells “how to” in a way that makes it easy for any reader to use and apply the material. 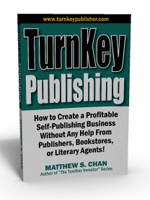 This book is one of my top choices, a “must read” roadmap for anyone contemplating the route of self-publishing and wanting to avoid the potholes with the result of having a successfully journey.